Full disclosure… This is a story in two parts! Saturday morning, the weather was glorious. Becky and Bailey got up about 4:15am to head toward Columbia for a barn hunt competition, so I was left to start my morning slowly, albeit very early. They got on the road, and I got my breakfast on, watching the opening matches of the new Barclay’s Premiere League season. After dallying about for far too long, I started to get gussied up for a run. I noticed that my Garmin had an update waiting, so I let it apply, and headed out. I’d decided to run on the Monarch Chesterfield Levee. This is the levee that, in theory, protects much of the Chesterfield Valley from the flood waters that area is prone to. It wasn’t lost on me that the Great Flood of 1993 would’ve had waters above my head as I stood atop that mound. I pulled in, and the weather was perfect — cloudy and about 74°. I rolled out of the Jeep, stretched, and walked up the access path to the top of the levee. This was the first time I’d run atop the levee, and as expected, it was very flat as it wended along the banks of the water. I saw loads of wildlife — egrets, blue heron and turkey vultures who circled as though awaiting me to keel over. I’d intended to run intervals, and set my Garmin to :15/:30 run/walk timing, and took off. As I motored along, I kept noticing my times were pretty awful. Now, everyone I’ve seen talk about intervals has said their times are faster when they run intervals. I sure wasn’t seeing it, so a little ways into my run, I turned that feature off, thinking it was slowing me down. The farther I got into the trail, the farther I wanted to take it. It was that whole “I’ll go to the next power pole” ideology, and eventually I found myself at Baxter Road. I caught my breath for a minute, looked at my Garmin, and I saw that I was lining up a 4-point-something-mile journey for today. Cool! And then I noticed the heat. I was looking at the area so much, I hadn’t noticed that the clouds were starting to clear, and temperature was rising. As I’ve mentioned many times, I melt in the heat, and this outing was looking to end on a very toasty, melty note, And as excited as I was to see what was around each new bend in the trail on the way out, I was hoping against hope that each bend on the way back would have my Jeep in sight! This event benefitted Action Against Hunger. Yesterday, I woke to the news from Orlando, and yet another apparent reminder that evil lives among us. I needed to put some miles under my feet, and put this out of my mind for a while. I’d had this event on my calendar for a while. I love running topical events, especially when there’s a charitable leg to them. There’s something about looking at my medal shelf, and seeing reminders of not just my successes, but also events in the public eye. This race, of course, brings focus to the awful situation in Flint MI. Once again, it was hot. There was some promise of pop-up thunderstorms with the heat, so I waited as long as I could before finally heading out into the neighborhood around 7pm. The rain never came, and there wasn’t a cloud in the sky. It was hot, and I was well on the path to becoming a puddle. I took the same route as I used on Friday. I’m growing to like it. There’s just enough shade to make these sweltering days a little more bearable, and the distance is just about exactly what I need for a 5km distance. Much like Friday night, there was nothing spectacular about my walk. However, I did a lot of reflection on the day’s events, and tried to get my head around why something as senseless as a massacre could happen in the city of my birth. This event benefitted the Catholic Charities of Flint. 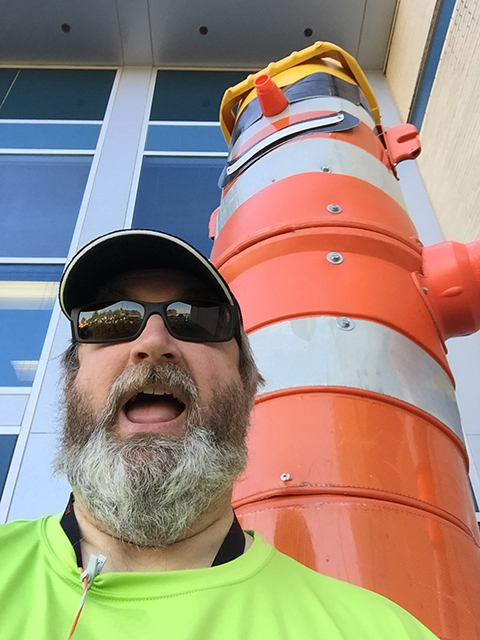 Saturday, I ran the MoDOT Work Zone 5K in Chesterfield. 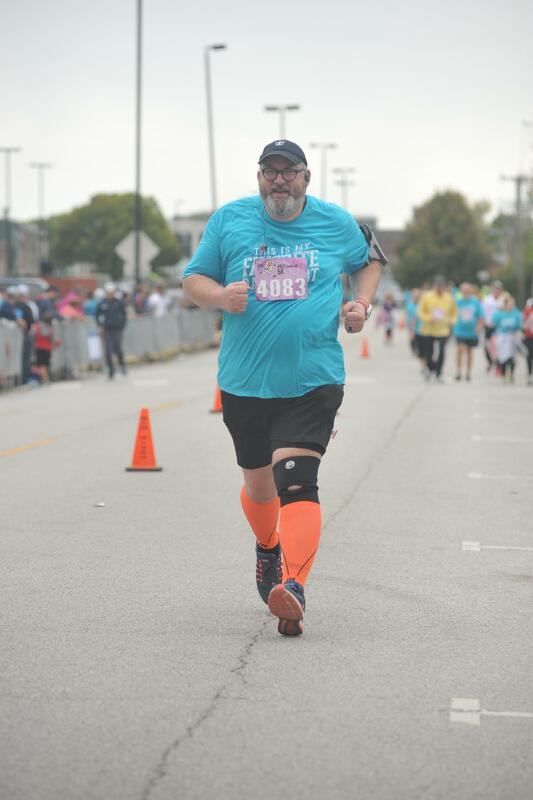 I ran this race for the first time last year, and enjoyed it. Like last year, this was a small race, with decent medals, really cheap entry fee, and a course that isn’t used on any other race I run… All good things! Since I’d run this course last year, I knew there were pretty decent hills on the course. I vowed to chug up the first one, and was able to do that much easier than I remembered from last year. I got my water at the halfway point, ran down the hill I’d just climbed, and then climbed the last hill heading toward the finish. And as I got pretty close to the finish, I spied Darla, cheering me on with Roxy in tow. 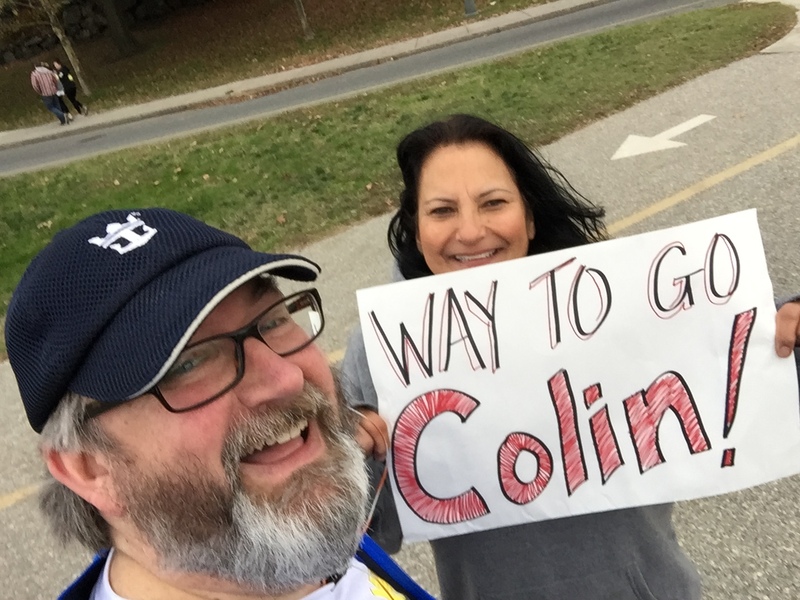 I was stunned by this, and ran over to get a puppy-snuggle on my way to the finish line. I finished the race, and found them again. Roxy was an absolute doll, and was friendly with everyone she met. Lotsa puppy kisses given out! 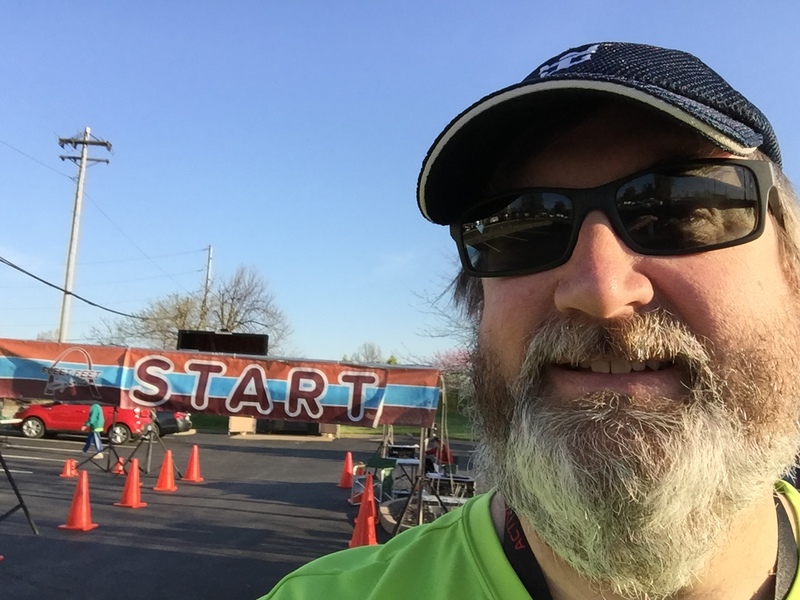 I did two things different — something you’re never supposed to do on race day! I fueled a little differently. When I was at Fleet Feet Friday, picking up my packet, it was time to re-stock my cache of Sport Beans, and I decided to shake things up a bit. I’ve been wanting to get some honey into my races, and while I didn’t find honey, I didn’t find some Honey Stinger Waffles. These are little flat wafers, with a moist consistency to them. I talked with the salesperson, and found that she uses those right before the race starts. I figured this was an out-and-back shortish race, so I’d give it a try. The other new thing I tried was Gu Chews. Now, I’ve gotta tell ya, I had good results using Gu packets last year, but the stickiness and consistency kinda caught up with me, and I stopped using them. These were packets of four chews — about the size of a hotel in Monopoly — and were easy to deal with, and quick to down. Did they do me any good? Well, I don’t know, but my time sure was good! And how good, you might ask? Well, last year’s race was 55 weeks ago (a little later start this year), and 101 races ago. Using the time from my Garmin (this race uses clock time for official time, so that’s a little inconsistent for me), I knocked almost five minutes off my time. FIVE MINUTES! That’s a huge improvement across a year’s span! So how’d I decrease so much? Well, the story’s in the splits. My first kilometer was almost the same between the two races — 8:36.8 vs 8:35.6, a negligible difference. The last kilometer was pretty similar too — 8:41.6 last year, and 8:21.5 this year. The real tale is in the middle. 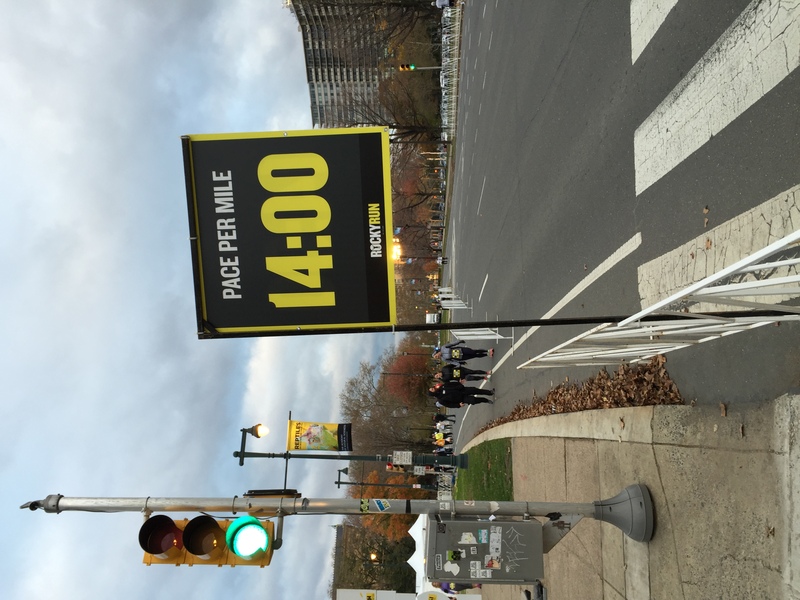 Last year, kilometer 2, 3, and 4 were 10:27, 11:23, and 12:00. This is were all the hills are on this course, and while they’re not particular steep, they are long. This year, those same three km were 9:02, 9:36 and 10:40, which were vast improvements. I was really pleased with my performance on this race. What’s goofy is that I didn’t really feel like I did all that well, but some reflection has definitely spun my opinion. Glad I was out there! Last weekend, I returned to Chattanooga, planning to run the inaugural edition of the Classic 150 5k and the Chattanooga Half Marathon. Little did I know that my weekend was gonna have a sudden left turn. Unfortunately, I’d been sick for the two weeks since Gasparilla. I think the snow-surf-snow escapades just before and just after the trip did me. It was head cold city, and no running before heading home to Choo Choo town. I rolled into town on Friday, staying in the brand new Holiday Inn downtown. While this wasn’t adjacent t0 the race site — my usual M.O. — it was wonderful, and so very nice. I relaxed, and set about looking for some dinner. 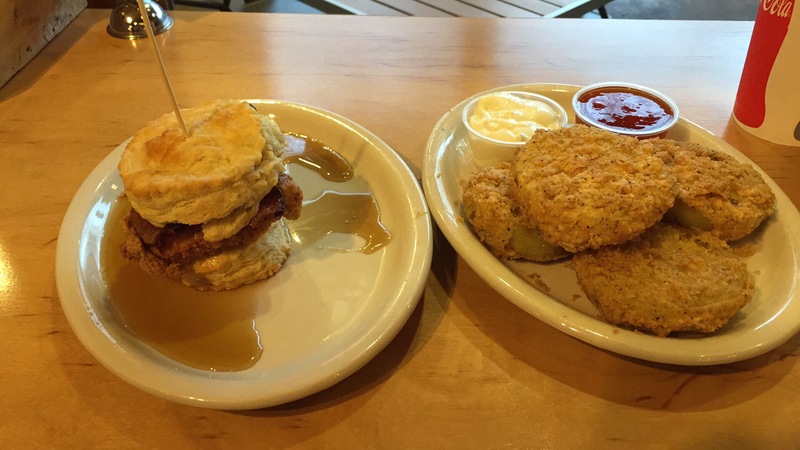 I looked at the map, and found a place called Maple Street Biscuits that was within walking distance. I strolled down for dinner, and had a scrumptious biscuit, filled with fried chicken breast meat, bacon, and slathered in maple syrup. On the side, I had fried green tomatoes, with housemade pepper jelly. Wow, was that ever great!!! I had a chat with one of the owners, talking about their coffee. They have a deal with Red Leaf Roasters, brining them several kinds of custom roasted coffee. I had the maple infused coffee, and fell in love, grabbing a sack to bring back to Da Lou. I got up early on Saturday, and drove down to Finley Stadium. Finley was also the site of the race in Chattanooga in February 2014, although in that race, we started and finished on the football field. Not so, this go around! Parking was at premium, but I was early enough to have no real issue. I found some coffee, slurped it down, and got into the starting corral. Time always seems to inch forward in the corrals, but soon enough, the start came, and I started chugging down the road. The course was astonishingly flat given that this race was in Chattanooga, and with that flatness came some speed. I ran through the south side neighborhoods and business district, and pretty quickly found myself back at the finish. It was the fastest time I’d had since October, and I was thrilled. There was a kids race shortly after the finish, and I hung around for a bit, waiting for that to start so I could head towards The Mountain on re-opened roads after the close of the day’s events. Mom ordered a pizza from Crust Pizza, and I played pizza delivery boy. It was the first time I’d had their pie, and it was uber-tasty. After a far-too-short visit on The Mountain, I headed back toward the hotel. This was the first time I’d had my shoes off since the race, and I discovered that my blister area from Tampa was awfully aggravated, and I had a good-sized blood blister formed around the relatively new toenail that had sprouted from the black toenail event at Tulsa. Once again, my feet were failing me, and I began to wonder if I had a shoe problem with my new Hoka’s. And Sunday would be the half. Ugh. 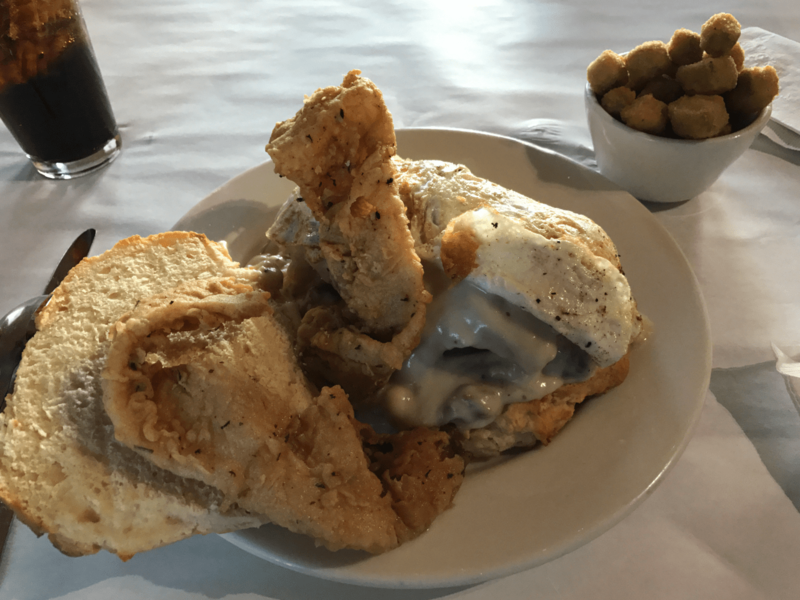 Dinner was at Maple Street Biscuits again, where I had the Squawking Goat — a biscuit, with fried chicken breast meat, a fried goat cheese medallion, all slathered in pepper jelly. I wasn’t sure the jelly and cheese combination would work, but it was spectacular! And the more I looked at my feet after I got back to my room, the more I questioned whether I should go out on the course Sunday for the half. As it ends up, I elected not to risk it. Both feet were in some discomfort before even starting, and I was pretty sure if I did the half, I’d be off the trails for a while, nursing what would surely be further aggravated injuries. I called the front desk, made arrangements to check out, and hit the road. And to add insult to injury, I got to watch the start of the marathon races from my hotel window, and subsequently saw runners on-course as I drove out of town. So, it was a disappointing weekend in some ways. I loved having the nice 5k finish, but I hated not even starting the half. I really wanna embrace the half marathon distance, and run those with some regularity. Until I get my shoe/foot situation squared away, that seems a long ways off. 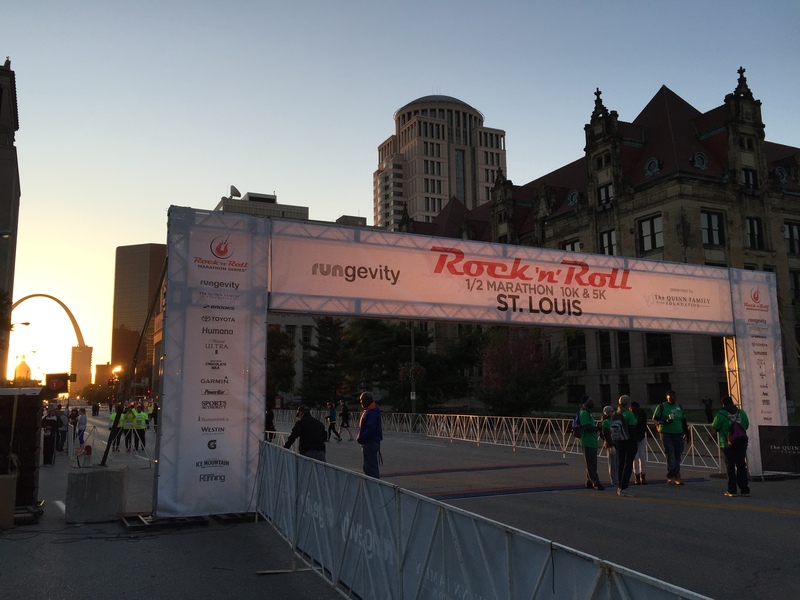 In the second of my back-to-back downtown weekend runs, today I completed the Rock ‘n’ Roll 5K here in Da Lou. This race started out with some crunky packet pickup woes. For some reason, the folks that run the race only had the expo open on Friday from 1pm to 6pm, with no same-day packet pickup… for a race that started at 8am on Saturday. To say the least, this was pretty inconvenient, given that I work for a living, and live about 30 miles away from America’s Center, where the expo was held. However, knowing I wanted to get this one done, I took off from work a little early, drove to the train stop, and rode Metrolink into town. The only nice thing about having to deal with this on Friday was that it allowed me the opportunity to pick up train tickets for this morning, and to fill up the Jeep in preparation for the race. The clock went off this morning at 5:20, and I started my normal race day routine — big glass of water, and an English muffin with peanut butter and honey. I’d gathered everything up last night that I’d need, and got on the road at 6am, knowing that I had two hours to get to the race site. I got in place in my corral just about 7:30, which was cutting it a little closer than I’d care for, and I awaited the start of the race. I’d re-aggravated a minor foot injury this week, and with that in mind, I knew I was gonna take it easy today, so I went over my game plan for the day. 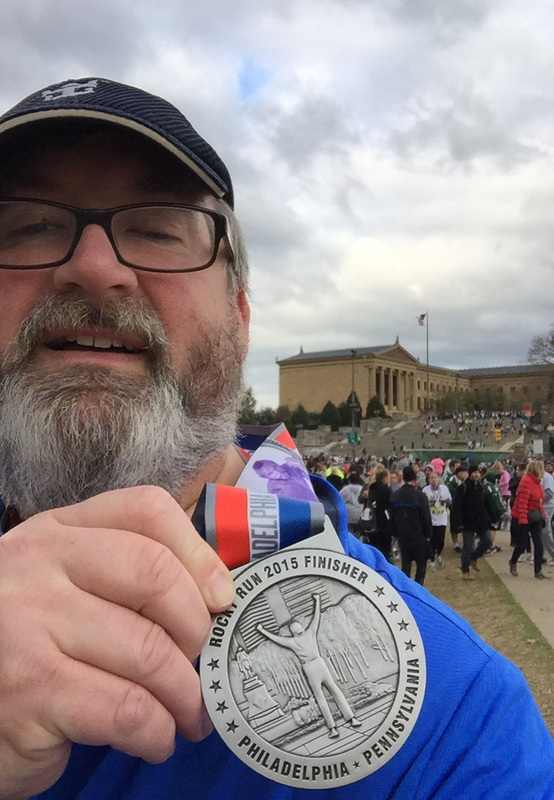 I was gonna walk a lot of the course to lower the potential for really tweaking my foot, and be happy with anything just above fifty minutes. Quickly, the race start time approached, and just as the National Anthem began to play, folks began to move up in the corrals. I stood still, hat over heart, and facing the flags around us. I know this is the grumpy old man in me rearing his ugly head, but it really bothered me that folks weren’t respectful of the anthem and flag, and were walking around, chatting among themselves, and carrying on. It wasn’t exactly like the recording was being played softly! Once I got past my little grumpy event, the corrals started being released. I was in the third (and slowest) corral, and got to watch the expanse of folks in the other two corrals ahead of me. By the time we were released, people stretched for almost a kilometer, in a head-bobbing mass of running humanity. Pretty dang cool to see. I crossed the start line, and jogged as I started. And with no pain in my foot, I kept jogging. Quickly, the first kilometer was behind me, at just under nine-and-a-half minutes. Not wanting to press my luck, I slowed to a walk for the second and third kilometers, each of which were around 10:30. However, the landscape changed, and began to be mostly downhill as I headed to toward the river and finish line. And with that slight downward incline, I kicked into a jog again, with my last two kilometers coming in at just a wiggle over nine minutes each. I’d expected a slow race, and had prepared myself for something just over fifty minutes. As it ends up, I cruised into a finish just under 49 minutes, which I was thrilled with. 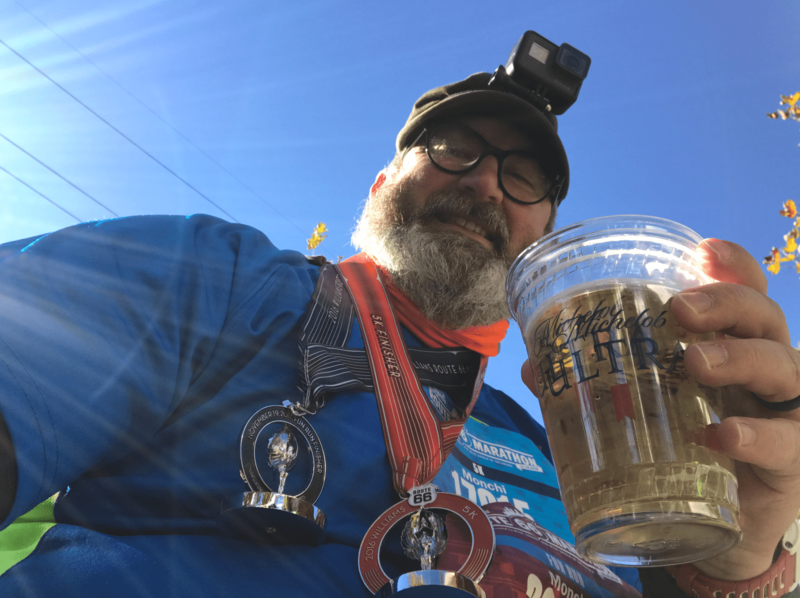 I grabbed my medal, and started making my way through the “secure” runners area. There were a couple of disappointments on the course. First, the one and only water table was just before 4km into the race, which is far too late to be worth much. The second was the availability of snacks at the finish line. I had a bottle of water, a bag of pretzels and a banana by the time I’d walked through the line. Frankly, that was a little disappointing, as I was really expecting chocolate milk at the finish. The chocolate milk folks had a huge display at the expo, which led me to expect chocolate milk would be lying in wait at every corner. Ah well. 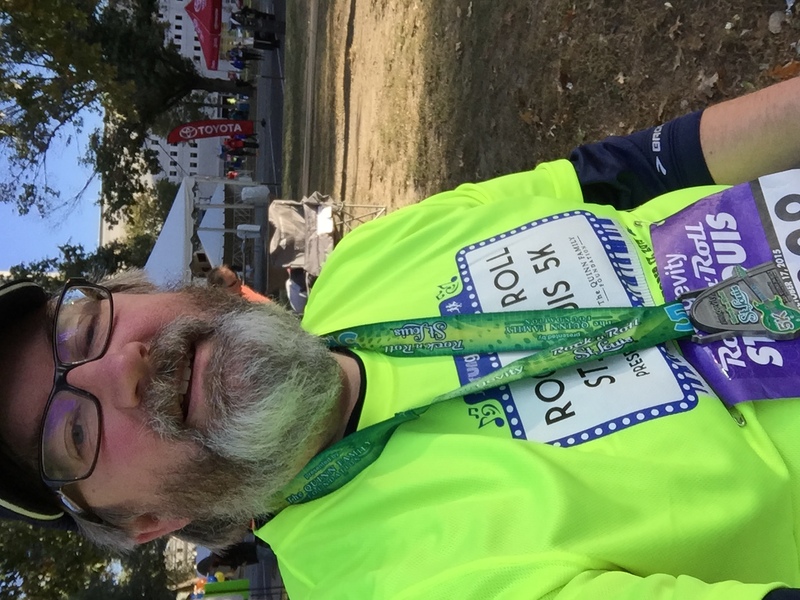 What’s kinda interesting is that Facebook reminded me that a year ago, I was running the first of two back-to-back Rock ‘n’ Roll 5K’s. It’s kinda nice to reflect on that race weekend, and contrast it against this one. That was the first time I’d run two 5K’s back-to-back, and it was tough. I suffered through that first race, finishing just barely under 51 minutes, and feeling lucky for that time. 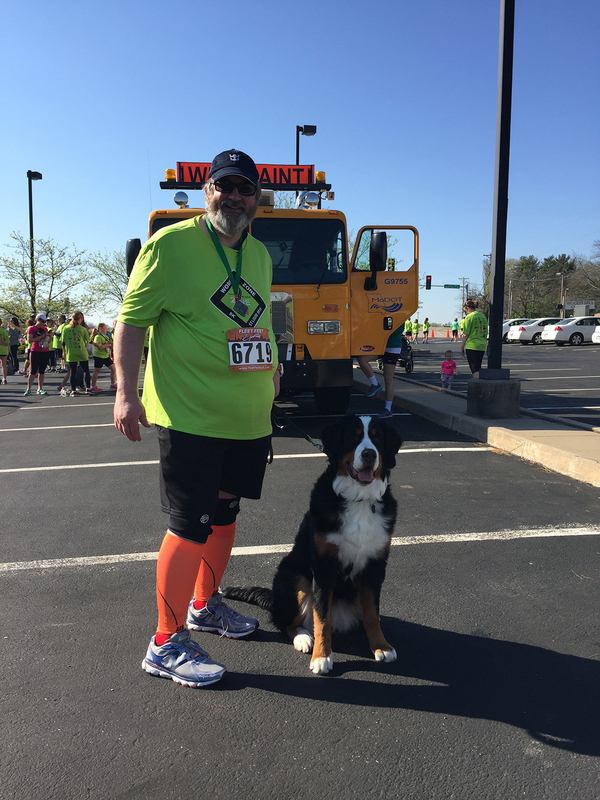 The second 5K on Sunday was nearly ten minutes slower. This year, I cruised through the course, finishing easily under 49 minutes. And that coulda been much faster, had I not been taking it easy. I’ve talked about this before, but I think plenty of practice this year has bred some real self-confidence. By the time of the RnR last year, I’d only run nine races all year. 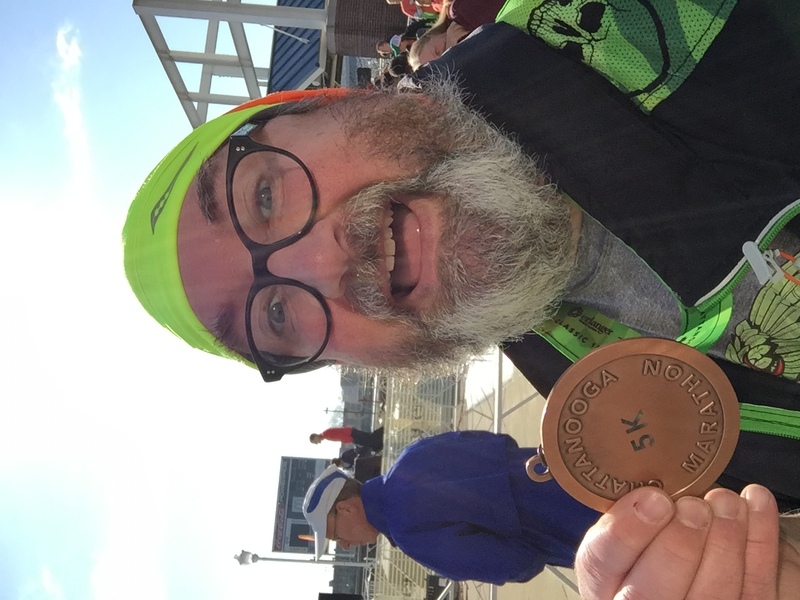 This year, the RnR was my 50th race of the year. I’ve learned to be comfortable in my running skin, and know that I can do this. I’ve figured out a nice pace that works well for me, and I’ve really gotten focused on making a race plan, and running that, regardless of the folks who pass me. 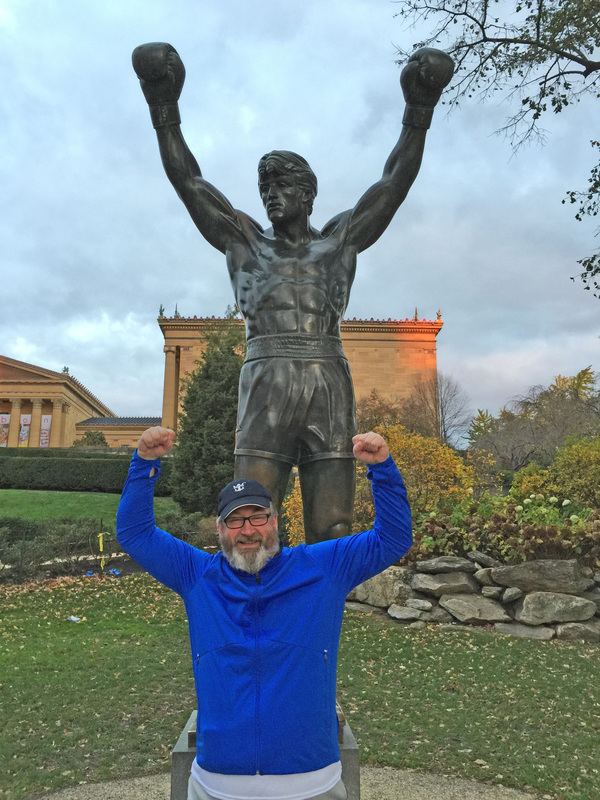 Shedding all that mental baggage has helped me enjoy running, and look forward to every run. And yeah, it’s nice to see some improvement in my times, although that’s not really the goal! This race benefitted Our Little Haven, TASK, and Unlimited Play.